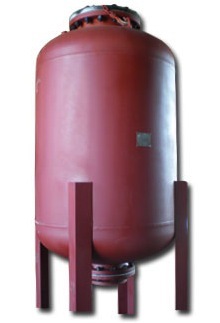 Wessels type SSA tanks are ASME replaceable bladder type pre-charge hydropneumatic tanks for commercial and industrial, municipal, and well water systems, to effectively control water hammer shock, and pump start-up/shut-down water surge. The vessels are fabricated to 250 PSI with large water system connection designed to accept potentially harmful water surge pressures quickly, with minimal pressure drop. The water is contained in a Butyl bladder.